For fans of authors like Barbara Kingsolver and Leif Enger, a stunning new voice in contemporary literary fiction. "Tragedy and blessing. Leave them alone long enough, and it gets real hard to tell them apart." Elena Alvarez is living a cursed life. From the deadly fire she accidentally set as a child, to her mother's abandonment, and now to an unwanted pregnancy, she knows better than most that small actions can have terrible consequences. Driven to the high mountains surrounding Leadville, Colorado by her latest bad decision, she's intent on putting off the future. Perhaps there she can just hide in her grandmother's isolated cabin and wait for something–anything–to make her next choice for her. Instead, she is confronted by reflections of her own troubles wherever she turns–the recent widower and his two children adrift in a changed world, Elena's own mysterious family history, and the interwoven lives within the town itself. Bit by bit, Elena begins to question her understanding of cause and effect, reexamining the tragedies she's held on to and the wounds she's refused to let heal. But when the children go missing, Elena's fragile new peace is shattered. It's only at the prospect of fresh loss and blame that she will discover the truth of the terrible burdens we take upon ourselves, the way tragedy and redemption are inevitably intertwined–and how curses can sometimes lead to blessings, however disguised. Margo Catts grew up in Los Angeles and has since lived in Utah, Indiana, and Colorado. After raising three children in the U.S., she and her husband moved to Saudi Arabia, where her Foreign Girl blog was well known in the expat community. Originally a freelance editor for textbooks and magazines, she has also done freelance writing for business, technical, and advertising clients, all the while working on her fiction. She is a contributing author to Once Upon an Expat. 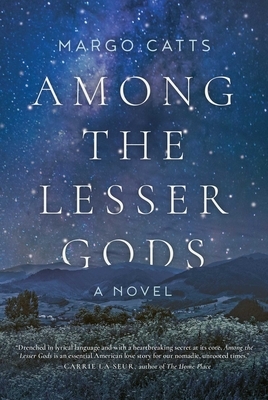 Among the Lesser Gods is her first novel. She currently lives in Texas.